This image shows marine life during the Cambrian explosion (~520 million years ago). 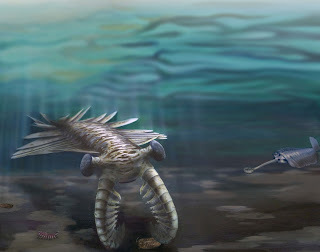 A giant Anomalocaris investigates a trilobite, while Opabinia looks on from the right and the "walking cactus" Diania crawls underneath. All of these creatures are related to living arthropods. Scientists report that Charles Darwin's evolution through natural selection theory is consistent with the sudden diversity of life during the Cambrian explosion. Their study shows that a sustained accelerated rate of evolution over millions of years would have resulted in an increased rate of over five times; 100 million years of evolutionary change would have only took about 20 million years. 580 million years ago, living organisms were mostly simple cells that occasionally organized into colonies. The following 70 to 80 million years suddenly showed a diverse amount of life that included animals, phytoplankton, and calcimicrobes. This period of the Earth's history is called the Cambrian explosion. During this period, the evolutionary rate of living organisms accelerated and the diversity of living organisms began to resemble that of organisms today. Fossil records have shown the results and aftermath of the Cambrian explosion but the reason for it to happen and why it has not repeated again is still a mystery. The incredible burst of innovation in animals' body plans and habits during the Cambrian explosion, between 540 and 520 million years ago, can be explained by a reasonable uptick in evolutionary rates. The discovery, based on the first rigorous estimates of early evolutionary rates in arthropods, shows that evolution's "big bang" is compatible with natural selection as Darwin envisioned it, say researchers reporting their findings in Current Biology, a Cell Press publication, on September 12. "This simultaneous burst of life, with few or no precursors, had seemed at odds with Darwin's idea of gradual evolution through natural selection," says Mike Lee from the University of Adelaide in Australia. "However, our results show that moderately accelerated evolution, sustained over a few tens of millions of years, could have produced this pattern. A five-fold increase in rates of evolution would compress about 100 million years' worth of change into about 20 million years—a relatively brief period in geological terms." The researchers considered arthropods—the group including insects, spiders, and crustaceans—because they were the most diverse and successful animals during the Cambrian explosion and remain so today. Arthropods currently account for more than 80 percent of all animal species. "To a first approximation, every animal species is an arthropod!" Lee says. "If we are interested in major patterns in animal evolution, arthropods are the key group to study." With the help of the fossil record and molecular dating methods, Lee and his colleagues quantified the anatomical and genetic differences between living arthropods to infer evolutionary rates in the past. Their analysis shows that evolutionary change during the Cambrian period occurred about four to five times faster than present-day rates. They were surprised to see that genetic evolution and anatomical evolution were sped up by almost the same amount during the Cambrian. Lee explains that those faster evolutionary rates are likely explained by game-changing innovations—predation, vision, and active swimming, for instance—that opened up a range of new possibilities for arthropods during the Cambrian. That kind of evolutionary fast-forward has also occurred when animals colonize new environments, he says. Think birds or mammals on islands, or snakes in the sea. "When a lineage acquires a novel adaptation, they often undergo a burst of evolution, to fill up a newly opened range of environments and niches," Lee says.